For other uses, see Cheesecake (disambiguation). An ancient form of cheesecake may have been a popular dish in ancient Greece even prior to Romans' adoption of it with the conquest of Greece. The earliest attested mention of a cheesecake is by the Greek physician Aegimus, who wrote a book on the art of making cheesecakes (πλακουντοποιικόν σύγγραμμα—plakountopoiikon suggramma). The earliest extant cheesecake recipes are found in Cato the Elder's De Agri Cultura, which includes recipes for two cakes for religious uses: libum and placenta. Of the two, placenta is most like most modern cheesecakes, having a crust that is separately prepared and baked. Modern commercial American cream cheese was developed in 1872, when William Lawrence, from Chester, New York, while looking for a way to recreate the soft, French cheese Neufchâtel, accidentally came up with a way of making an "unripened cheese" that is heavier and creamier; other dairymen came up with similar creations independently. Modern cheesecake comes in two different types. Along with the baked cheesecake, some cheesecakes are made with uncooked cream-cheese on a crumbled-biscuit base. This type of cheesecake was invented in America. Almost all modern cheesecakes in the United States and Canada use cream cheese; in Italy, cheesecakes use ricotta; Germany, the Netherlands, and Poland use quark. Cheesecakes are most easily baked in a leak-proof springform pan, often paired with a water bath to more evenly distribute the heat. Because of the high density of most cheesecakes, they continue baking for some time after removal from an oven. The early Greeks considered it a cake. Some modern authors point to the presence of many eggs, the sole source of leavening, as proof that it is a torte. Still others claim that the separate crust, the soft filling, and the absence of flour prove that it is a custard pie. South Africa has many different varieties of cheesecake. 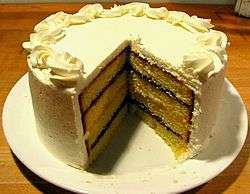 One popular variant is made with whipped cream, cream cheese, gelatine for the filling, and a buttered digestive biscuit crust. It is not baked, and is sometimes made with Amarula liqueur. This variant is very similar to British cheesecake. This cheesecake is more common in British South African communities. Australian cheesecakes are more commonly unbaked. Common flavors include passionfruit, chocolate, raspberry, lemon, caramel, and vanilla. Bulgarian-style cheesecake uses cream cheese in a New York–style filling and smetana for a top layer. Ground nuts are often added to the crust mixture. French-style cheesecakes are very light, feature gelatin as a binding ingredient, and are typically only 3 to 5 cm (1 to 2 inches) high. This variety gets its light texture and flavor from Neufchâtel cheese. German-style cheesecake (Käsekuchen, Quarkkuchen, Matzkuchen; Topfenkuchen in Austria) uses Quark (dairy product) and a freshly made dough, not Graham crackers. The Käsesahnetorte (cheese cream tart) adds cream and is not baked. This recipe is sometimes translated into English using rennet-based cottage cheese, but a true Quarkkuchen uses quark cheese made from sour milk. Quark is used for the famous German or Bavarian baked cheesecake. In Greece the cheese cake has been made since antiquity and is now traditionally made using mizithra. There are many regional variants of the mizithropita. Ancient Roman-style cheesecake uses honey and a ricotta-like cheese along with flour and is traditionally shaped into loaves. Some recipes call for bay leaves, which may have been used as a preservative. Italian-style cheesecake uses ricotta or mascarpone cheese, sugar, vanilla extract, and sometimes barley flakes. This type of cheesecake is typically drier than American styles. Small bits of candied fruit are often added. Dutch/Belgian-style cheesecakes are typically flavored with fruit or melted bittersweet chocolate, are generally made with quark, and are not baked. Belgian cheesecake also includes a speculaas crust (speculaas is a traditional Dutch-Belgian biscuit). Polish sernik (cheesecake), one of the most popular desserts in Poland, is made primarily using twaróg, a type of fresh cheese. Swedish-style cheesecake differs greatly from other cheesecakes. A Swedish cheesecake is not layered and is traditionally produced by adding rennet to milk and letting the casein coagulate. It is then baked in an oven and served warm. Since the process of curdling milk is somewhat complicated, alternative recipes intended for home cooking instead use cottage cheese as a base to simulate the texture of the dessert. Swedish-style cheesecake is traditionally served with jam and whipped cream. There are two different types of Swedish cheesecake from different regions in Sweden. To avoid confusion with other cheesecakes, Swedish cheesecake is usually called ostkaka. 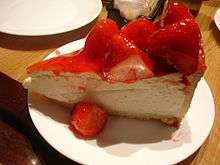 The United States has several different recipes for cheesecake and this usually depends on the region in which the cake was baked, as well as the cultural background of the person baking it. These cheesecakes are typically baked before serving. New York–style cheesecake relies upon heavy cream or sour cream. The typical New York cheesecake is rich and has a dense, smooth, and creamy consistency. 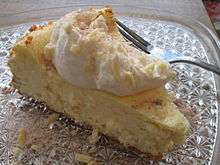 Sour cream makes the cheesecake more resilient to freezing and is the method by which most frozen cheesecakes are made. However, a lavish variant uses sour cream as a topping, applied when the cheesecake is cooked. It is mixed with vanilla extract and sugar and replaced in the oven, essentially making the cheesecake twice-baked. Pennsylvania Dutch–style cheesecake uses a slightly tangy type of cheese with larger curds and less water content, called pot or farmer's cheese. It can be found in Amish, Mennonite, Ex-Amish, and German-American communities throughout southern Pennsylvania. It can also be found in Amish communities through the US, and sometimes in other countries with Amish communities such as Canada, Mexico, and Russia. This cheesecake is not very common outside of these communities. Philadelphia-style cheesecake is lighter in texture, yet richer in flavor than New York–style cheesecake. This cheesecake is rare. New York–style cheesecake is commonly eaten in Philadelphia, where this variant is from. However, it still can be found in specialty bakeries throughout the city. Farmer cheese cheesecake is the contemporary implementation for the traditional use of baking to preserve fresh cheese and is often baked in a cake form, along with fresh fruit like a tart. This version is very similar to Central and Eastern European recipes that use Quark/Farmer's Cheese. Most communities that make this have a large amount of people of Eastern or Central European descent. Country-style cheesecake uses buttermilk to produce a firm texture while increasing acidity to extend shelf life. This can be found is some rural communities throughout the country. Outside of rural communities, this cheesecake is quite uncommon. Chicago style cheesecakes are firm on the outside and have a soft and creamy texture on the inside. They are popular in Chicago. These cheesecakes can be found outside of Chicago as well, and some frozen cheesecakes are Chicago-style. In addition, Trader Joe's sells frozen Chicago-style cheesecake made by a bakery in Chicago. Cheesecakes represented as being "New York style" are the most common variety in the United States; the term has considerable prestige. However, increasing distance from New York City itself tends to decrease the accuracy of the label, with cheesecakes made further from the city decreasing in density and richness and increasingly over-sweetened by New York standards. The genuine article is most likely to be found at Jewish-run delicatessens in large urban areas and high-end restaurants that make a point of serving gourmet-quality food. Savory cheesecakes are also made, often for an hors d'oeuvre or served with accompanying salads. In Argentina, cheesecake is usually served with strawberry or another berry marmalade on top. Brazilian-style cheesecake is made with cream cheese and condensed milk, with the addition of gelatin and/or ricotta cheese. Mulberry jam is a common choice for the top layer, as well as strawberry, raspberry, or guava (goiabada). Colombian cheesecake uses honey or panela and cuajada (curd) mixed with wheat or maize flour. Sometimes it is served with strawberry, blackberry, or uchuva jam; rarely it is served with boiled figs. It is a quite popular dessert in the central East Andes region. 1 2 Wilson, C. (2002). "Cheesecakes, Junkets, and Syllabubs". Gastronomica. 2 (4): 19. doi:10.1525/gfc.2002.2.4.19. ↑ Heston Blumenthal (2013). Historic Heston. Bloomsbury. p. 35. ISBN 978-1-4088-0441-4. ↑ Berenbaum, Rose Levy (1988). The Cake Bible. William Morrow Cookbooks. ISBN 978-0-688-04402-2. p. 80. ↑ "A South African Favourite: Amarula Cheesecake". The International Hotel School. The International Hotel School. August 2014. ↑ Mitchell, Russ (21 November 2010). "Say Cheesecake!". CBS News. Retrieved 17 December 2010. ↑ Krause, Andrew (2006). "Different Types of Cheesecake".